The passing of BB King this week has been marked by Presidents, rock stars, mere mortal fans and those simply jumping on the hashtag bandwagon. But how many, I wonder will pause to consider his rightful claim to the title of ‘legend’ and his journey from an impoverished childhood to the honours bestowed upon him for decades? Born to sharecropper parents on a plantation in Itta Bena, Missisippi in 1925, Riley B. King spent his formative years playing for dimes on street corners, travelling from one town to the next until, in 1947 he hitch-hiked to Memphis, Tenessee to kick start his career in the hot bed of the blues. It was a remarkable journey and the years he spent playing clubs, bars and prisons to segregated audiences endeared him to audiences for his graceful manner and devotion to his craft. It is generally acknowledged that the great blues songs come from a place deep within, where hardship or a love lost created a lyric or solo which only real experience can truly convey the emotion required. From the age of four when King’s mother abandoned him to live with another man he was already building up an emotional rite of passage which led to a string of hits from the 1950s including Grammy awards, an induction into the Rock n’ Roll Hall of Fame as well as numerous projects with high profile artists from U2 to The Rolling Stones, Gary Moore, John McLaughlin, Cyndi Lauper and countless others. 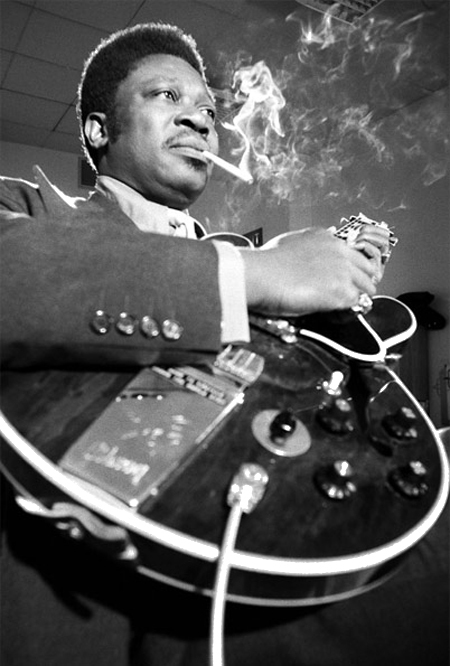 I genuinely was a BB King fan for many years. For me, he brought the blues to a wider audience without selling out. His music was accessible in a way Robert Johnson and Muddy Waters wasn’t. It was BB who opened for The Stones on their 1969 American Tour and only BB could tell a tale like the story of ‘Lucille‘ on a live album and get away with it. Who else could tell U2 that “I don’t do chords, so someone else will have to”? But more importantly than that, he earned fame and fortune by fighting his way out of the shame of racism in America, he was an integral part of a group of black men and women who gave a voice to the suppressed and downtrodden. He faced up to inequality and beat it and this week we say goodbye to another of the greats who really will not and cannot be replaced.